With deep red to brown velvety flowers, Chocolate Cosmos or Cosmos atrosanguineus gets its name from the colour of the flower as well as the fragrance of the flower. This is a perennial plant from Mexico and it thrives in a warm climate. The perfume of the flower is perhaps secondary to the impact of the attractive flowers. Rising well above the foliage on tall wiry stems this is plant that looks great both in the garden and when grown in containers. A favourite perfumed plant with its dark red flowers it has a sweet perfume, reminiscent of vanilla and chocolate that is released late in the afternoon after the heat of the day has done its work. The fragrance is much stronger on hoy sunny days. Look for the cultivar ‘Cosmos Choca Mocha’. We grow ours in the perennial border amongst small salvias and lavender. These companion plants give it a little protection over winter. 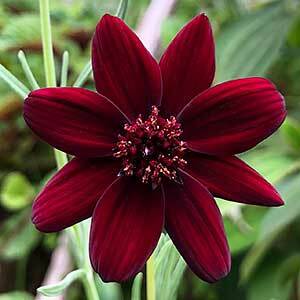 Chocolate Cosmos is mainly grown for the velvety flowers. excellent when planted in a position where the flowers can be allowed to rise above surrounding plants. Excellent in the rock garden where drainage can be controlled. Plant it near the front of the border where the flowers can be fully appreciated. This is plant that looks great when mass planted in containers. The flowers are very attractive to bees and butterflies and are also excellent as cut flowers. Drainage and sun are the two most important factors. Clay soil are not suitable and will need to be amended. In areas with very wet or cold winters, the tubers will need to lifted and overwintered. Allow the soil to dry between waterings, fertilise with a liquid seaweed fertiliser every two weeks when in active growth. In colder areas you will need to bring the plant indoors over winter, or ensure that it is a well drained soil and mulched well over winter. Spread – This is a tuberous rooted perennial that will form a clump to around 30cm over time. Soil – Humus rich well drained. Soil needs to be on the dry side in winter. 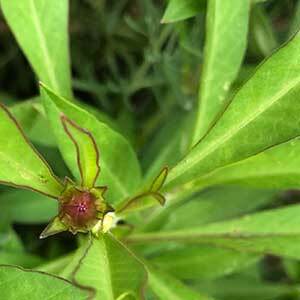 Flower Colour – Chocolate Red to Brown. Easy to propagate by basal root cuttings taken in late winter to early spring. The seeds of the plant are sterile. Cosmos atrosanguineus or Chocolate Cosmos is available for sale from the following nurseries.